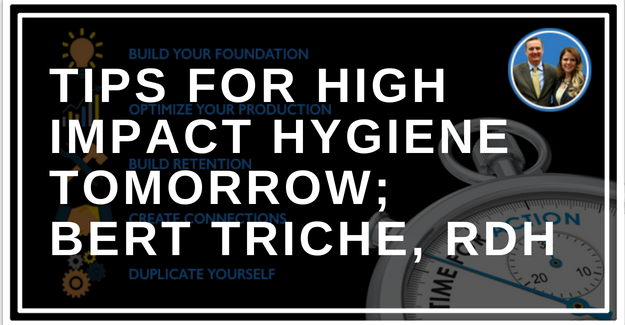 Dr. John interviews our own hygiene coach Bert Triche, RDH who addresses tips and tricks used to impact your job as a hygienist or your hygiene department. Dynamic hygiene departments that work cooperatively as a team with the doctors have the opportunity to dramatically affect production and more importantly- patient care. Help your patients uncover the problems that they have and then provide solutions that allow patients to get the best care and create a world class office experience! S1 00:00:02.294 [music] Welcome to the Double Your Production Podcast with the Team Training Institute. 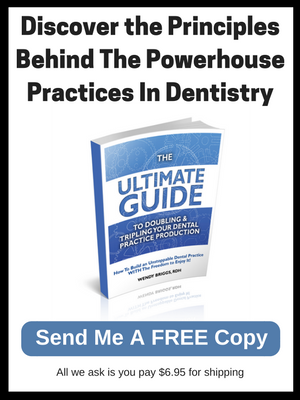 The one place designed for dentists and their staff, who want to grow their practices by following in the footsteps of those that have done it, who are in the trenches, who know exactly what you’re going through. And now your leaders, the stars of the podcast, Dr. John Meis and Wendy Briggs. S2 00:00:29.506 Hey. 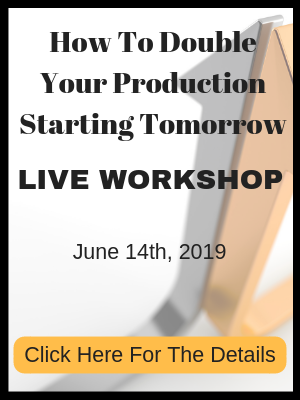 Welcome, everybody, to this edition of the Double Your Production Podcast. I’m Dr. John Meis, and I’m so excited to be here today with one of the Team Training Institute’s own coaches, Bert Triche. How’re you doing, Bert? S3 00:00:43.598 I’m doing great, Dr. John. How’re you doing in the 112 degrees [laughter]? S2 00:00:48.342 I’m doing good. Here in Arizona it’s dry heat. But where you are, in Louisiana, it’s not a dry heat. S3 00:00:57.679 No, it’s very moist, but great for your skin. So I’m not going to complain, it’s just okay. But very hot at the moment. The pools are like bathtub water, and that’s not refreshing. S2 00:01:08.713 Yeah. Ours is 95 degrees, so. So tell me Bert, how did you get started in dentistry? S3 00:01:18.783 Well, that’s an interesting story because when I went to college, I wanted to be a lab tech, which wound have put me behind a microscope. And as I quickly discovered, I am not a person who can– well, I’m a people person, right? And to be in a lab all day behind a microscope looking at little bugs swimming around was not my thing, and I quickly discovered that. It’s a funny story, but I started dating a dental student. And he said, “You should be a hygienist because I’m going to be a dentist, and you can be my hygienist when we’re married.” And needless to say, I am not married to him, but here I sit a hygienist 38 years later [laughter]. So I really think that maybe he was a person who was sent to me to tell me what I was supposed to do, right? S2 00:02:09.281 Yeah. There you go. S3 00:02:10.545 Quite a heartache, but that’s okay [laughter]. I’m right where I needed to be. So anyway, that’s how I got into dentistry, and then I went to Loyola University, got a degree. I was an alternate to get in, that was funny. I had to beg for a spot. There were 55 of us, and only 33 of us went [inaudible]. And I was one of the 33. So a lot of these girls thought they wanted to be hygienists, and ended up not being hygienists. And then I was fortunate enough to go back to my hometown, and I was hired by a practice that two young dentists had just bought from the old guy in town. So I started with them from the ground up and ended up staying 31 years as their hygienist/girl Friday. I ended up being the office manager at the end, which gave me a wealth of knowledge. So I’m not only a hygienist, but I also know a lot about the business of dentistry because of that practice. S2 00:03:06.272 Yeah, that background has been so valuable for you as a coach because you kind of understand both sides of it, and you can talk both languages. And often, there’s a divide between the administrative team and the clinical team because they speak different languages. S2 00:03:25.336 So how do you become interested in becoming a coach? S3 00:03:29.089 Well, at the time, I was 29 years a hygienist. And my boss was a real CE kind of boss. He took me all over the place. And I was sitting in a seminar, and Wendy was the speaker. And she went up on the stage, and she started talking about all these things that we should be doing for patients, and I wasn’t doing any of them. And quite frankly, at the moment, I thought I was the best hygienist in all the United States. And obviously, I wasn’t because she was doing things I wasn’t doing. And so I got excited about some of the things she was talking about. And we went back to my practice, we implemented, which– actually, I listened to it on video back then, DVDs. One day she told us, [inaudible] in a matter of two weeks. Though we were like, “Okay. We’re on to something.” And then she came into practice as a coach, and [inaudible] hygiene at that point. And I got really good at what she does, and she was paying attention. And so she started talking to me about the possibility of being a coach, and [inaudible]. She had a vision of me that I didn’t have of myself, and I was just lucky enough to be in the right place at the right time, and got good at what she taught. And now I teach it. S2 00:04:48.366 Well, you’re extremely effective at it. And our clients that have you as a coach, they all love you because you bring a lot of personality to your coaching, don’t you? S3 00:05:01.929 Yes. If it can’t be fun, it’s not worth it. It’s nothing, right? If you can’t laugh at it and have a good time, then it’s not worth doing it. It’s work. So it’s a unique way of looking at what I do and make a lot of jokes about it because it makes it fun, and they remember, right? They never remember what you said, but they remember how you make them feel. So give back [laughter]. S2 00:05:26.007 Yeah. Good point. When you go into practices, you generally have a pretty good idea of what’s going on before you get there because you’ve generally looked at some numbers and reviewed it. So you kind of have a good sense of what’s going on. And one of the things that I’ve observed in practices is that the dentist is really trying to improve their practice, improve the performance of their practice. And they often pick something that’s really complex to fix, and avoid something that’s very simple. And really, the most effective leaders I’ve seen always kind of play on the simple side: they fix the easy things first, because when they fix the easy things first, the complex become more easy. So I wonder if you had some examples of some simple things that you’ve seen have a high impact when practices fix them. S3 00:06:24.043 Well, one of the things with hygienists that I focused a lot on is tracking. And using tracking, that’s a really easy thing to do. And it’s quite simple. I mean, you change a phrase, you change a little bit about something you do, and then you track on a week and see if the impact was positive or negative. If patients are saying yes to treatment they weren’t before, then you’re on to something, and you keep changing what you’re saying until you find that way to do it. And you get the highest result with that. That’s an easy way for a hygienist to say– I think we tend to have a resistance towards looking at numbers sometimes because we think the focus is all on money, and that’s not it. The bottom line is that the number goes up. You’re doing a better job at presenting what you’re presenting. So tracking would be one. The other thing is mastering one skill before you jump into another one. We want to try to do everything all at one time, and if we’ve missed a piece of the foundation, we’re not going to get the result with all of these things. Risk assessment is an example of that, with what we teach. If a hygienist doesn’t get to really have that conversation about risk, then all of the other things are irrelevant because she’s not going to have a basis for why they need the services. And then it becomes about money. And it becomes about everything else, except what it’s meant to be about, which is the better care of that patient. So trying to take on too much all at the same time is another thing. My boss is famous for that. S2 00:08:16.584 You mentioned that hygienists sometimes are reluctant to look at numbers, or I guess they really aren’t numbers people, most of them. S2 00:08:28.034 And so just the simple act of knowing your number will improve performance, won’t it? Just simply knowing what it is. S3 00:08:37.141 Of what they are [laughter]. We tend not to want to look at that because doctors always look at the numbers because they run a business. And they have to look at the numbers. So when it comes to the staff, that’s what they talk about a lot. So the staff gets this, “I don’t want to talk about numbers, I just want to take care of my condition.” Well, the direct result of taking care of your patient is that the number goes up. [inaudible] at a better level, it goes up. So you have to look at the number to know if you’re being affected. S2 00:09:09.675 And we’ve always had the approach that the focus is on what’s best for the patient, but the measuring stick is the dollars. And I like to take that number, take the dollar sign off, and just have it be a raw number because really, if you focus on dollar, patients can tell they don’t like it. And I’ve never seen a practice be successful with that as their focus. It’s so simple if you just focus on what’s best for the patient, and the money follows pretty easily. S3 00:09:41.107 And of the benchmarks that we use to measure how well hygienists are not about money, really. You know, their percentages, the number of services that they’re doing, as opposed to what they were doing before, not really with the dollar. I really don’t ever talk to them about that when we do calls. It’s better not to. But the number of services that they’re doing. How many [inaudible] are you doing now compared to what you were doing before? How many fluoride treatments? You know, those kinds of things. S2 00:10:10.130 So one of the great things that I’ve seen you teach is how to get case acceptance for hygiene procedures, whether they’d be prevented procedures, or carried-out procedures. So you had mentioned a simple tool that’s helpful for that. Helpful in getting patients to understand it, to understand what the problem is, and create a desire in them to get the care that they need. Do you want to talk a little bit about that? S2 00:10:43.020 The risk assessment. S3 00:10:45.178 Oh, the risk assessment. Yes, okay. So risk assessment is the foundation. For me, it puts it in black and white. And there’s something about a patient seeing it on paper that makes it [inaudible]. We can tell them, “Till the cows come home, you have this, you have this, you have this,” but they can choose to believe it or not. And in the health profession, they’ve done this for years, right? They fill out a form, we fill out a form, we answer questions. We talk about what’s there, and what’s not there. And then from that, we deduce things about a patient. But in dentistry, we haven’t done that very effectively until now, you know, until Wendy has brought this to light. So for me, as a hygienist, [inaudible], I have one mission, and my mission is I need to help my patient uncover the problems that they have, and then offer solutions to their problems. Well, a big part of uncovering the problems is the risk assessment. It identifies for them what the problems are that maybe they didn’t even know existed. And then once they know how many of these problems they have, they need to do something about it, or, “Here’s the result you’re going to get.” I think it makes it better for the patient. And then patients are not going to pay for something they don’t get, right? And in order to get them to want it, they have to understand the need. They won’t buy what they need, they buy what they want. But they will but a solution to their problems that they see is big. And until they own the problem, they’re not going to pay [inaudible]. So what risk assessment does for me is help them own their problem. A hygienist owns the problem for the patient, and then we try to get them to fix the problem they don’t really believe they have. So the risk assessment is all about getting them to believe that the problem [inaudible]. S2 00:12:41.410 It’s really a valuable tool, and it creates such a great framework for a discussion with the patient so that the patients understand what their condition is, and what they can do about it. 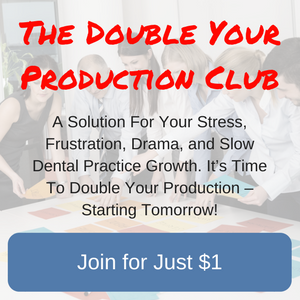 So I know you would never say this, but I can say this, that sometimes we dentists are our own worst enemies, and sometimes we find a way to become an obstacle for our hygienists to have super high performance. And so can you share with us some of the places that you’ve seen dentists kind of struggling with letting their hygiene team perform at the highest level possible? S3 00:13:32.942 Well, for one thing, coming in an exam and not backing with a hygienist, not being on the same page, that’s one place I see a big problem most of the time with dentists. Or coming in and saying something different than what the hygienist has said, which [inaudible] this two different opinions in the room at the same time. And first of all, you [inaudible] a hygienist, and secondly, the patient gets confused, which gets in the way of treatment acceptance. So you’ve always said, “No matter what Dr. John said, then we’ll agree at the moment [laughter],” and then talk about it later. And I say that sometimes, right? S2 00:14:21.576 I think there’s a way to disagree respectfully. But the key thing is that, if the hygienist has set up treatment, and the doctor doesn’t pick that that treatment is the most appropriate thing, if there’s a mismatch that happens, other than once in a blue moon, it’s the doctor’s fault that they haven’t taken the time and effort to help their hygienist understand their treatment philosophy. They have to know, “When we see this, this is what we do,” which requires the dentist to train that. And it requires the dentist to be consistent. And so when they see it every time, that’s what they’re going to do. So about disagreeing respectfully, I think the easiest way to do that is, first of all, praise the hygienists for what what they had observed, praise them for talking about an option, and praise them that, “That was really sharp. In this particular case, though, Sally, I see this and this and this, which makes me think that a better approach might be to do this. What do you think about that?” And so now, all Sally has to say is, “Doctor, you’re a genius [laughter],” or something to that effect. Just support the other doctors. So the team may have been separated, but now they’ve come together, and now they are a team working for the patient’s best interest. So that is the best way that I’ve seen doctors handle that situation. S3 00:16:08.133 Right. The other problem with doctors coming in, sometimes they’re not respectful of time. They either don’t come, or they come and stay too long, which gets in the way of the hygienist getting done what they need to do. I just had a call this morning, and the hygienist was so frustrated because the doctors just didn’t come. They didn’t come till the end, and they had all this treatment they could have done, and they can’t get it done because the doctor doesn’t come in. So we talk through how we would handle that with the doctors because– and basically, what we talked about was, I said– we just really had an open conversation and said, “First of all, I track for a couple of days the reality of what was happening, the patients that were involved, and what treatment was missed. And here’s what happened in these two days that we looked at. We had six opportunities. We could have done this. And we didn’t get it done because you didn’t get in that room in time. Now we understand that you were busy and you got stuff going on, but the bottom line is that, if we’re going to serve our patients at the highest level, this is what needs to happen. And you’ve said you want to do that, so what can we do to make that happen?” Right now, we’re all part of the solution, and it’s not an attack. You’re not doing this, and I’m doing this, and all of that. So to work cooperatively as a team, and all being part of the solution is part of it. The doctors’ intention is that they really want to do well, I know, most of the time, but other stuff gets in the way. But the only thing that’s going to change that is awareness, and constant consistency with bringing it up at meetings, and talking about how it failed, and what didn’t work. And then offering to be part of the solution instead of just fussing about it, and say, “What can we help do that will help you get in that room sooner?” Sometimes it involves assistants being in that conversation, and being part of it. So that gets in the way of hygienists getting it done as well. S3 00:18:12.854 And then sometimes doctors come in and will– if a hygienist has made a suggestion for desensitizing or – I find this with [inaudible] a lot – doctors have this preconceived notions that a patient can afford something, or that they wouldn’t want it, or that kind of thing, and they override the hygienist’s ability to get the patient to do it. They just say, “Oh, no, no. Why don’t you just do it for free today? Why don’t you just do a [inaudible],” if they need something else. So that kind of stuff, to not being on the same page, not being calibrated, disagreeing. Like you said, there’s a way to handle that. But a lot of times, they just need to get out the way. That’s a trust issue sometimes, too, in not trusting your hygienist in what she’s talking about, or not knowing exactly what’s going on in the operatory because you haven’t trained her, you haven’t talked about it. That kind of thing. Doctors are in the way there as well. And that’s a lack of training, and a lack of trust on the part of the doctor. You’ve got to trust that your hygienist knows how to have that conversation, and then support it. S2 00:19:23.666 Yeah. And the only way you build that trust is by doing a really good job of educating, bringing people to the same set of clinical standards and philosophies, and being open to discuss it when it doesn’t work right. So that alignment gets better and better and better over time. S3 00:19:45.181 Right. Lack of alignment is one of the biggest problems I see, the doctors in the way. They need to control everything, too. I mean, it’s bigger than the doctor a lot of times. And you have to have team leaders who you can put in charge of that and trust that they’re getting the message across to the team members so that they’re not in everything. I see doctors a lot of times needing to be in everything, and sometimes that gets in the way of it happening as well. S2 00:20:14.823 Yeah. And if they’re in everything, then they don’t have time to do as much treatment. They’re not as productive, so. S2 00:20:22.200 All right. Well, Bert, I’m so grateful that you could hop on this podcast with me today. I really feel blessed that you and I have the opportunity to work together. You’re such a pleasure. You bring a passion, and an energy, and thunder to our organization. And I just want to thank you, from the bottom of my heart, for all the great things you do for our clients and our team. S3 00:20:46.564 Well, I certainly appreciate you and Wendy in all you’ve done for me. And I’m blessed to be in this job, and now give back a little bit of all the pearls I’ve learned in all the years. So thanks for the opportunity to talk to the masses and share a little bit about what I’ve learned. It’s been great. Thanks so much.